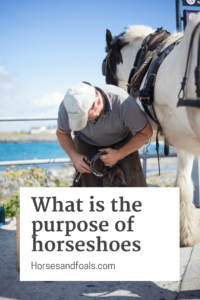 What Is The Purpose Of Horseshoes? Do horses really need to wear shoes? Are there different types of shoes? What kind of shoes does your horse need? In this article we explain the reason horses wear shoes, share a little history and provide sound advice on shoeing your horse – or not. Read on to learn more. 1 Why Horses Wear Shoes? 3 Do Horses Really Need Shoes? 4 If You Have A Horse, You Need A Qualified Farrier! 5 Why Should You Have Your Horse Shod? 6 Is A Barefoot Horse Better Off? 7 How Do You Decide Whether Your Horse Needs Shoes? Horses hooves, like our fingernails, are made mostly of keratin. They grow continuously and must be trimmed and filed regularly to keep them in good condition. The purpose of horseshoes is to help prevent excessive wear and tear and hoof breakage. Most people are familiar with curved metal horseshoes that are fitted onto a horse’s hoof with nails. The nails are driven through the hard part of the hoof, and this process does not hurt the horse. 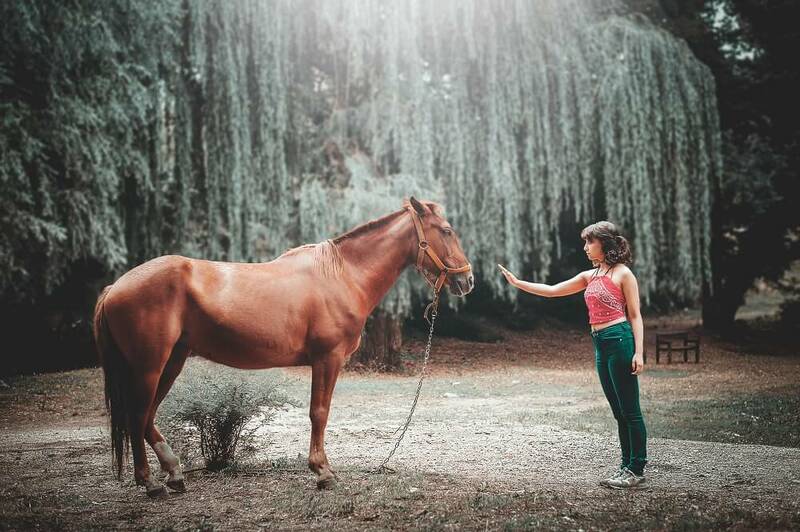 Since humans’ partnership with horses began, the idea of horseshoes has been in place. Native Americans and long-ago horsemen in Asia provided their horses with tough leather boots to protect the entire hoof. Ancient Romans also used leather to fashion shoes for horses. They called them “hipposandals”. Today variations on this method of shoeing are gaining popularity. 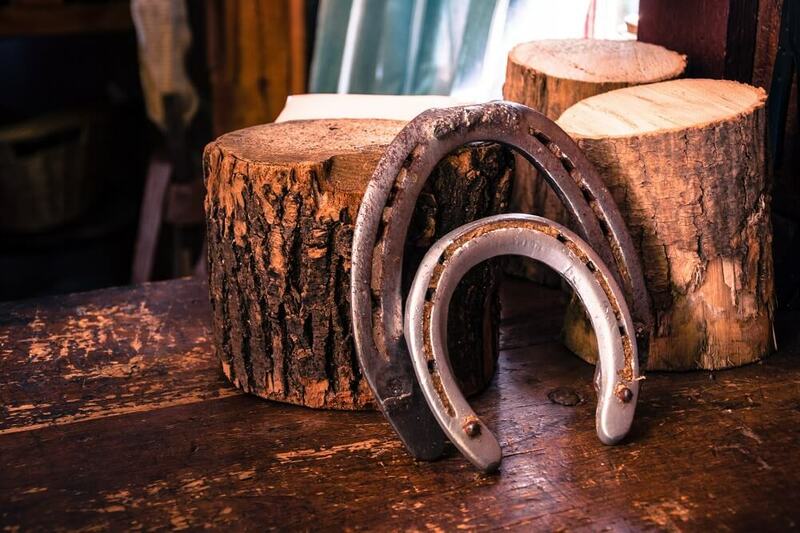 Handmade bronze horseshoes dating back to 1000 AD have been found in ancient Etruscan tombs and ruins, but it was not until the 13th or 14th century that horseshoes were manufactured in great quantities. At this time, iron was the chosen metal. Do Horses Really Need Shoes? In the wild horses don’t need shoes. They eat the diet they are intended to eat and they move about freely over a varied, mostly dry terrain. Wild horses’ hooves tend to wear down just right and their constant movement over natural terrain causes the soles of their hooves to become thick and tough. The soft, heavy soil of a pasture setting does not provide even hoof wear the way that the arid lands of horses’ origins did. 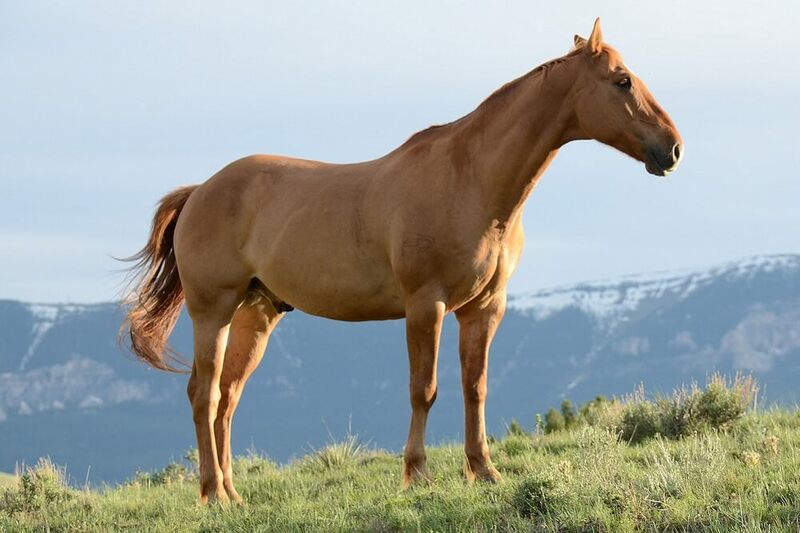 Domesticated horses who live mostly on grain, walk on smooth or soft surfaces and have limited movement tend to have thinner soles and more fragile hooves. Their hooves are more likely to break and crack than to wear down smoothly and evenly. Horses who must stay in stalls face another challenge. The ammonia in collected urine causes the keratin of the hoof wall to soften and weaken. Shoeing will not help with this. This is one of many reasons good stall management and cleaning is absolutely essential. If You Have A Horse, You Need A Qualified Farrier! Farriers are trained professionals who have knowledge and understanding of hoof structure and anatomy. Shoeing horses is only a small part of their work. You should locate and engage a qualified farrier to visit your horse once every two months to trim the hooves and adjust or change the shoes, if worn. A truly qualified farrier has received training in veterinary medicine as it applies to the lower legs and hooves of horses. Be sure to check your farrier’s credentials before allowing him or her to work on your horse. We would not recommend farrier your own horse unless you have been properly trained. Improperly trimmed hooves can cause injury and lameness. Why Should You Have Your Horse Shod? Horses who have been injured or have problems with bone structure or musculature often need therapeutic shoes. Your farrier may wish to work in concert with your veterinarian to determine exactly the right sort of shoes for your horse. Horses who have foundered (suffered hoof damage due to an excessively rich diet) need therapeutic shoes to provide support to the sole of the hoof until the hooves have grown out completely and recovered. Just as humans are better off walking, jogging or running in well-fitted, supportive footwear, horses can maintain an even gait, pull more effectively, jump higher and run faster with the right shoes. Horses that perform specific jobs need different types of shoes. For example, specially designed racing plates help racehorses move swiftly without drag. For working horses or horses in heavy competition, good shoes relieve stress on the leg bones and joints caused by concussive force. Modern horseshoes may be made of metal or lightweight, durable plastic. They may be nailed on or glued on. Additionally, removable hoof boots are a wonderful option. As with all decisions regarding your horse, your first and foremost consideration is your horse’s individuality. Different horses of different ages, workloads, builds and living circumstances need different types of hoof care. This is why it is so important to partner with a truly qualified farrier and establish a regular schedule of trims and hoof maintenance. A skilled farrier can help you catch potential problems before they become unmanageable. Is A Barefoot Horse Better Off? The practice of nailing metal shoes to horse’s hooves has always been a hotly contested practice. Some people say that it is essential for good hoof and horse care. Others say that it is detrimental in all circumstances. Those who oppose the use of metal shoes say that they cause horses discomfort and that it simply cannot be good to make holes in the hooves. They say that this damages hoof structure and interferes with blood circulation within the hoof. Recent research tends to back up the anti-shoeing contingency. It is now believed that if a horse has healthy hooves and good conformation, shoeing will interfere with his overall health and well-being. Generally speaking, horses whose diet is not grain-heavy tend to be healthier overall and to have healthier hooves. Horses who do not have a heavy workload and do receive regular farrier services are unlikely to injure their hooves. When this is the case, going barefoot is usually the better alternative. Talk with your farrier about traditional shoeing as compared to modern, removable alternatives or simply going barefoot. Most farriers agree that a horse is better off going barefoot for at least some portion of every year. Farriers who specialize in a “barefoot trim” strive to reproduce the perfect hoof shape found on healthy wild horses. If you prefer to have your horse go barefoot, you must ride carefully. Avoid rough terrain, rocky ground and pavement. Keep to the grass and softer areas when you ride. Be especially careful if you have recently had shoes removed. Wearing shoes can cause a horse to become tender-footed because shoes hold hooves up above the ground. This can cause the sole of the foot to become thin. This means that when you transition to barefoot, your horse may feel discomfort when traveling on rough surfaces, just as you would walking barefoot across gravel. When you transition from traditional metal shoes to barefoot, you may wish to use modern horse boots to help your horse adjust. These can be used whenever you ride. Allow your horse to go barefoot when he is out to pasture or in his stall. Horse boots are so comfortable and effective that many horses participating in trail rides, polo, police work and other demanding activities wear them comfortably and successfully. How Do You Decide Whether Your Horse Needs Shoes? Keep in mind that “to-shoe-or-not-to-shoe” is not a permanent question. Your horse may need shoes of a particular type now, shoes of a different type under other circumstances and no shoes at all under still other circumstances. Are your horse’s hooves smooth, tough and well-formed? Does your horse have good conformation? Does your horse have any musculature, bone or joint problems? Is your horse’s workload light, moderate or heavy? 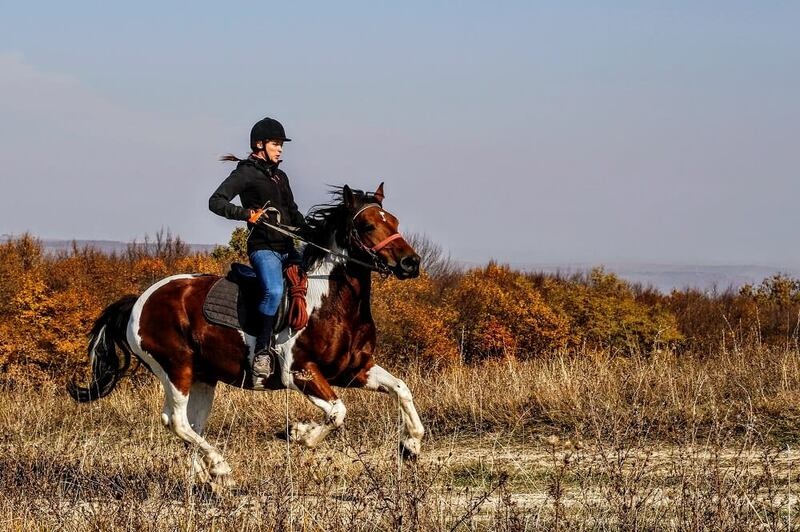 Does your horse get enough exercise? Is your horse provided ample time to graze? Does your horse suffer from any condition, disease or injury that would necessitate shoeing? If your horse is not experiencing any hoof problems now, and you do not anticipate a change in circumstances or workload, shoes may be unnecessary. Consult your veterinarian and your farrier about any hoof concerns you may have. Recognize your horse’s individual traits and your own needs. Listen carefully to the advice of your vet and your farrier. Working together, you will surely come up with just the right hoof treatments for your horse.